I am a serial blogger. By that, I mean, that on occasion I find something about which I have the combination of a passion to share and time in my life to write. Dining at home. Farm stands. Lisbon. And so I write. And write. I am sort of an all-in kinda’ guy. It’s hard for me to do blog-light. As sometimes happens with passion, you get burned out by it. That leads to long periods of no blogging. Plus blogging is a curious activity. No one has asked me to blog. I push the “Publish” button on my computer and off it goes — exactly to where it’s hard to know. So here we are, you and I, at the beginning of a blogging journey about Rome and Naples. I enjoyed the journey immensely and I hope you do too. If you know others who might want to tag along, please invite them. Grazie. I have traveled a lot. Not everywhere, but I have seen some things. I was not prepared for Rome. 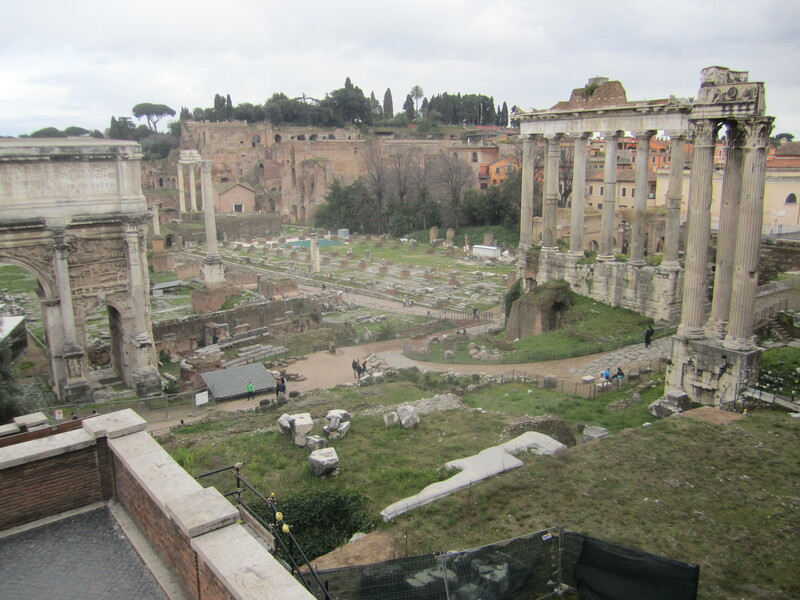 In March, Christina and I spent eight days in Rome, punctuated by a six day visit to Naples. Periodically over the next weeks I will share daily images and impressions with you. 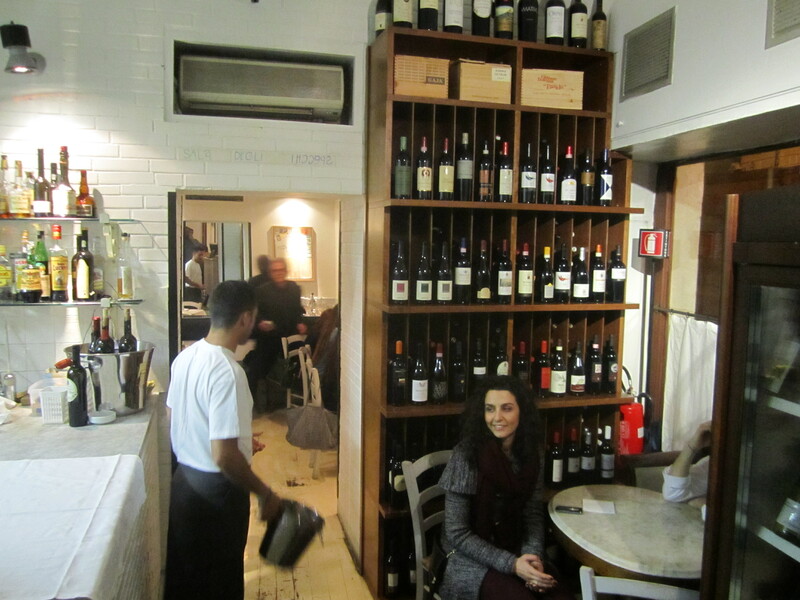 Our first night in Rome, we dined at Grano — a small restaurant about a fifteen minute walk from our hotel in central Rome. 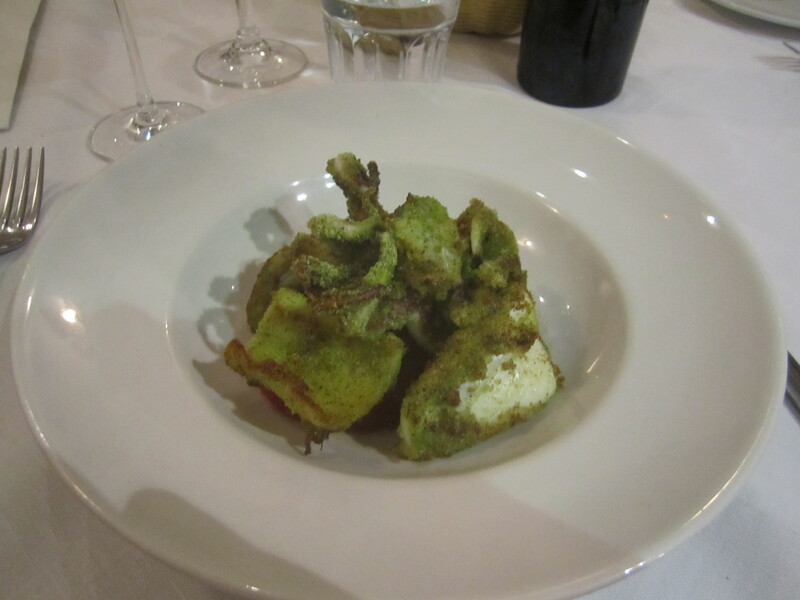 The dinner itself was the first in a parade of soul-satisfying meals in Rome and Naples. What struck me this night was Grano’s floor. 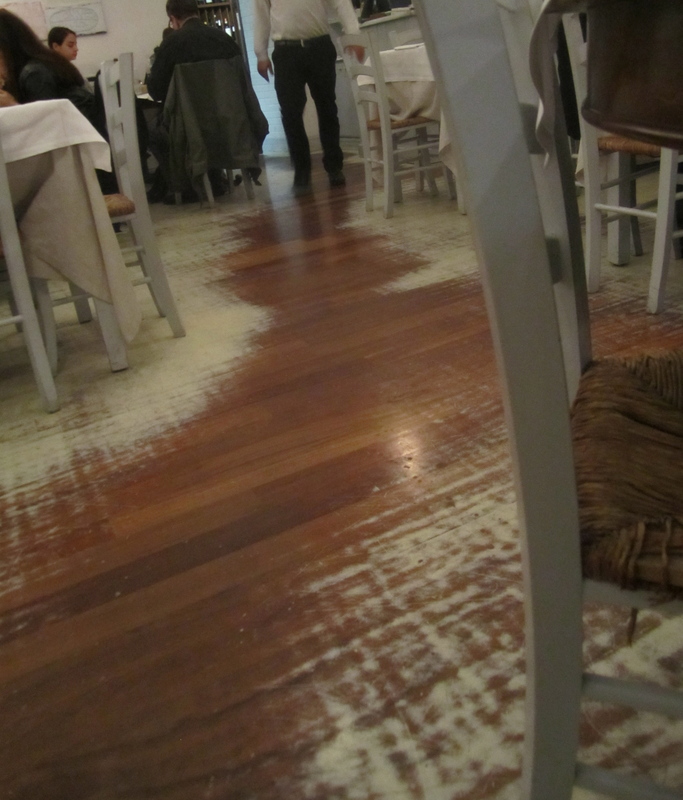 Once the floor was freshly painted pristine white to match the walls of this warmly contemporary restaurant. Fresh white tablecloths cover painted white tables and painted white chairs hold rustic cane seats. But what gave Grano its particular patina — its sense of time and place, was the etched path of honey-brown wood beneath the white paint — a path worn into the floor by Grano’s waiters ferrying bread baskets and wine glasses and countless plates laden with lovely food — waiters with pasts and triumphs and disappointments, with loving mothers and fathers, or not, and wives and children and children who had children. And in the kitchen cooks doing what they love to do, or what they have to do to pay the bills. If you look for it, it’s all there in that floor. Grano, today, is the sum of all that went before and so is Rome. In Rome’s case, it is a present that reflects the wear of nearly 2800 years. According to legend, Rome’s founding involves infant twins named Romulus and Remus abandoned by the Tiber River, a nurturing she-wolf, and fratricide. Rome was founded in 753 BC by the avenging twin — Romulus. That’s 2,766 years ago or about 140 generations of Romans! During the height of the Roman Empire in the 2nd Century AD, Rome’s population surpassed one million. It would not be until the later part of the 18th Century that a Western city would again reach one million — London. By the mid-6th Century Rome’s population had dropped to as low as 30,000 as the Empire that sustained Rome collapsed. Today Rome’s population is 2.8 million making it the fourth largest city in the European Union after London (8 million), Berlin (3.5 million) and Madrid (3.3 million). Paris is fifth at 2.3 million. It is a continued source of amazement that you can get on a plane in Philadelphia or wherever your home may be, and before too many hours, step into a different world. My only previous visit to Rome was forty-five years ago. I was on a summer’s long world-expanding seven week trip around Europe between my junior and senior years at Penn. Overall, the trip would alter the course of my life. But my recollections of Rome were a larcenous cab driver, an over-priced hotel and an overwhelming city. We left for points north as quickly as we arrived. The bitter aftertaste of that brief stop cast a shadow on a return to Rome. But Christina had fond memories of a long student stay in Rome and numerous professional visits in her capacity as Managing Director of Baryshnikov Productions. In addition, she had recently kindled an interest in her Italian ancestry and wanted to visit Nusco, the mountain-top birthplace of her maternal grandmother. Nusco is in the province of Campania and about two hours from Naples. This time Rome was different. I do not speak Italian. Nor does Christina (though she has an excellent accent with the words she knows). So I seized the opportunity to listen to our driver’s halting English about her life in Rome during the 25 minute or so ride from the airport to the area of Rome known as Centro Storico — the city’s historic center. She was in her fifties and unusual as a women to be a driver. Her husband died some years ago and left her with two growing children and without pension or financial support. He had worked hard but not for the government or company with a retirement program. Her working daughter is thirty and lives with her boyfriend. Her son lives with his mother and goes to university in economics. He is anxious to leave Italy for the United States where he and his mother believe that people advance based on their merit rather than in Italy where they believe advancement is based on who you know in the domains of government or the Catholic church. It is a somewhat ironic notion given that on a list of the 134 major countries in the world, Italy ranks 32nd in equitable wealth distribution compared to the US rank of #93. Statistics on wealth distribution are not necessarily a reflection of social mobility. In Italy, the United States continues to be perceived as the land of opportunity as it has been for generations of Italians including Christina’s maternal grandparents who came to the United States in the early 1900’s. We arrived in Rome at an interesting time. Italy today faces great social and political turmoil. A recent national election proved indecisive with three political factions splitting the vote. The leading vote getter was the incumbent party associated with recent attempts to accommodate to the fiscal demands of the EU. This party was followed by the party of the scandalized and discredited Silvio Berlusconi of bunga-bunga fame. Berlisconi is a media mogul and among Italy’s richest citizens who has thrice served as Prime Minister. An insurgent “none-of-the-above” party, lead by a comedian who had been convicted of manslaughter and is adept in the use of social media, received 25% of the vote. No party received enough votes to form a government in Italy’s parliamentary system. So, despite the need for leadership and decisive action, the country is at a political standstill. In addition, our arrival in Rome coincided with the conclave to elect a new Pope under a vast cloud of intrigue, corruption and the stench of conspiracy and pedophilia. It’s a mess! 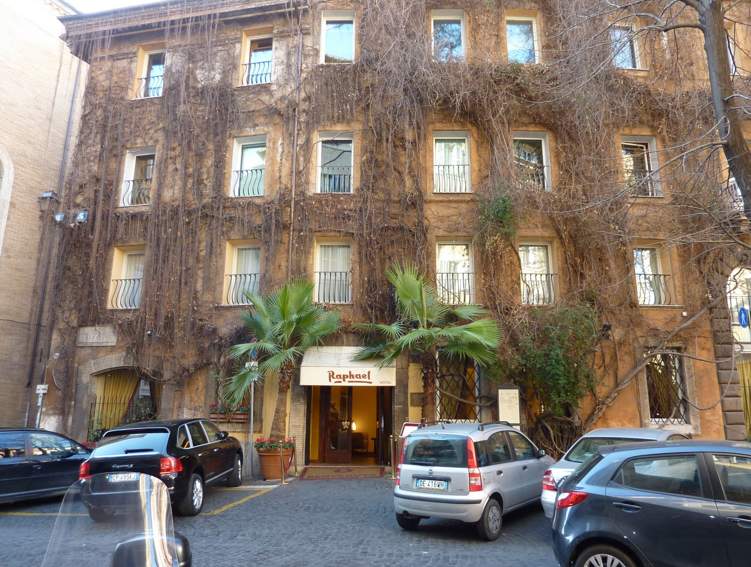 As it was too early to check into our hotel, we set-out to wander through the remarkable back streets of central Rome. In Italy, espresso is the beverage of choice. Espresso bars line the streets and neighborhoods of Rome. 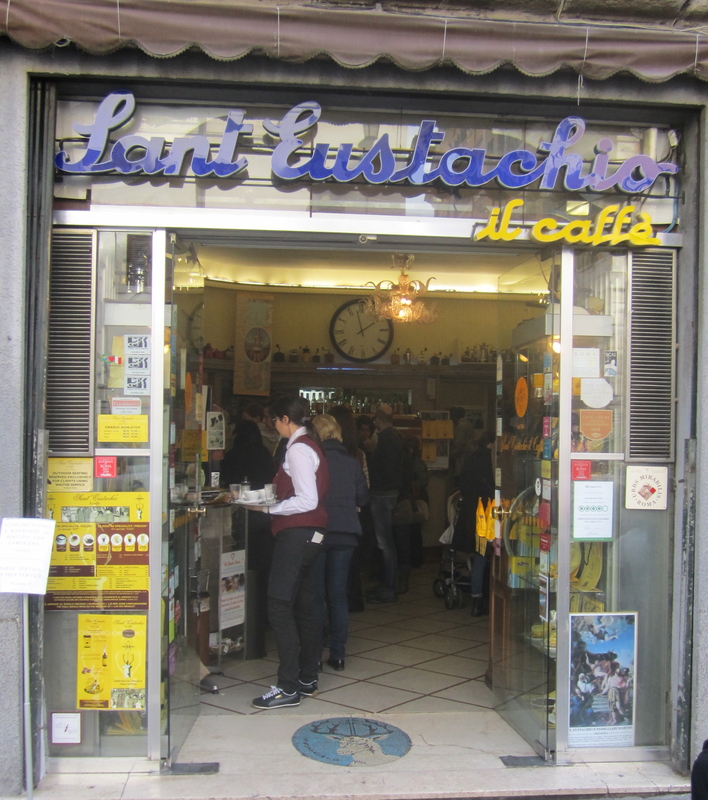 Our circuitous walk lead us to the legendary espresso bar, Sant’ Eustachio where a secret technique yields an espresso head worthy of an extra thick milkshake. Sant’ Estachio is named for the church that sits across the small piazza from the bar. Sant’ Estachio, the church, dates to the 8th century and was restored in the 12th century. As we continued to stroll our new Rome neighborhood, we bumped into a couple who live in an apartment eight floors above ours in Philadelphia and are spending three months in Rome. Go figure. My pre-Rome reading consisted primarily of Robert Hughes’ epic art history aptly named Rome. 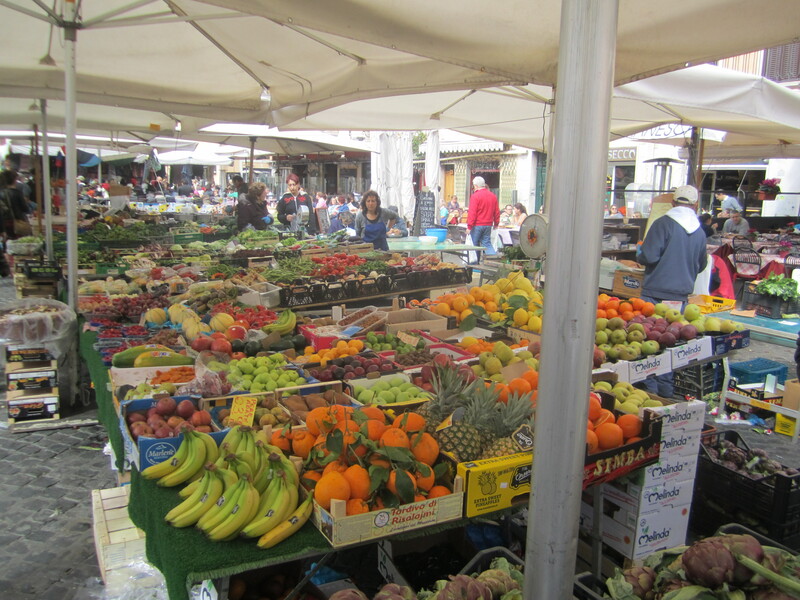 A modest amount of food-focused research placed the Campo di’ Fiori outdoor market within the general neighborhood of our hotel. 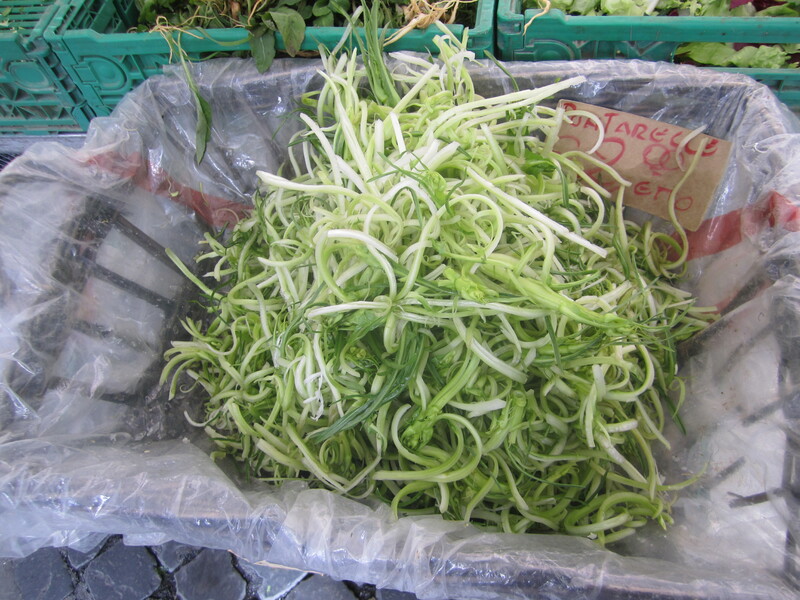 One would think that a food-famous city like Rome is crawling with sprawling outdoor markets but such is not the case. As Campo di’ Fiori is located in a touristy area, the market is a modest mix of food stalls and tourist-focused merchandise set in the middle of a small piazza surrounded by shops, restaurants and palazzi. Camp di’ Fiero translates as Field of Flowers and in the northeast corner a series of picturesque flower stalls are located. 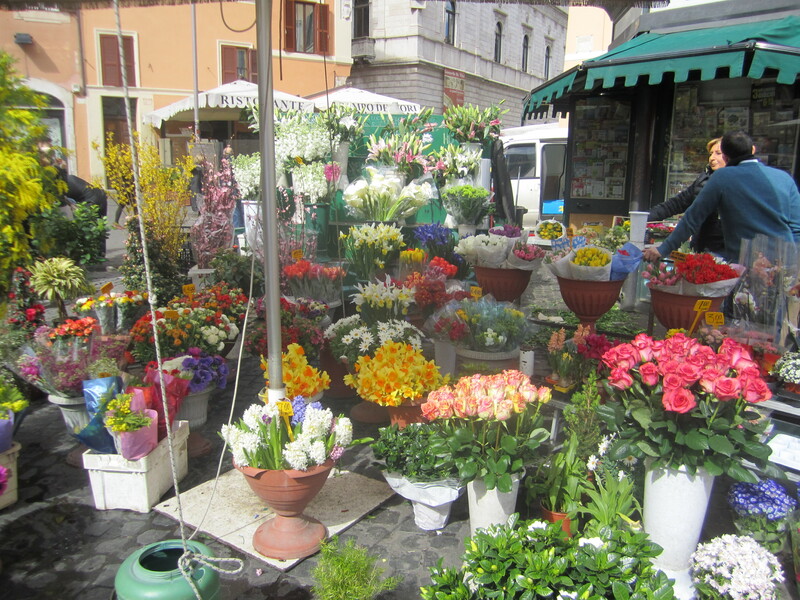 But the real treasure of Campo di’ Fiero lies just beyond the flower stalls. When I grew up, our kitchen was adorned by murals my mother had a muralist copy from James Beard’s Fireside Cookbook. One of those murals was captioned, “‘Tis not the food but ’tis the appetite that makes eating a delight.” Granted a long plane flight that offered tired airplane food left us with an appetite’s edge, but we maintained our sufficient culinary integrity to discriminate terrific street food. 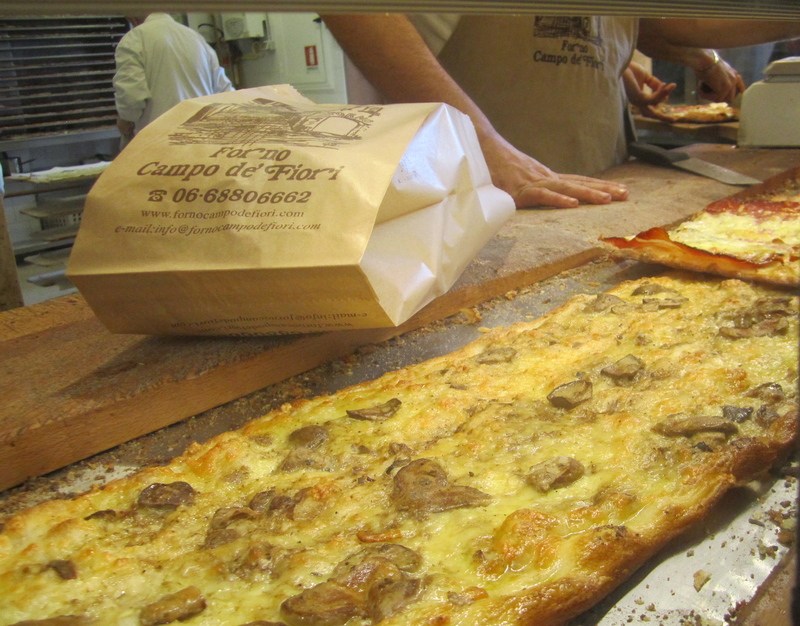 A long line snaking from a modest storefront lead us to Forno Campo di Fiori. Forno means oven and out of the oven with fifteen vertical racks — pictured in the background — a continuous flow of sizzling, thin-crusted rectangular pizzas slid onto a wooden counter to be sliced, folded over and delivered into the hungry waiting hands of expectant diners. I selected the mushroom pizza above and Christina a prosciutto and mozzarella. The pizzas cost E5,00 each. While the appetite may have added to the pleasure of devouring, fond memory of these pizzas linger today. The Piazza Navona is one of the world’s friendliest great public spaces and the center of the first of two neighborhoods in which we stayed in Rome. 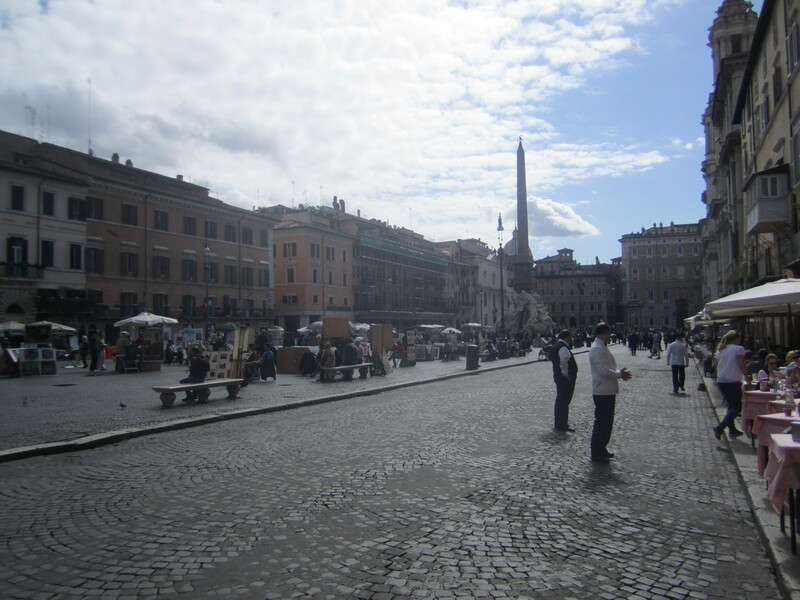 More on Piazza Navona in a later post. By mid-afternoon, with a mix of tired and elation, we were ready for our hotel and our hotel was now ready for us. 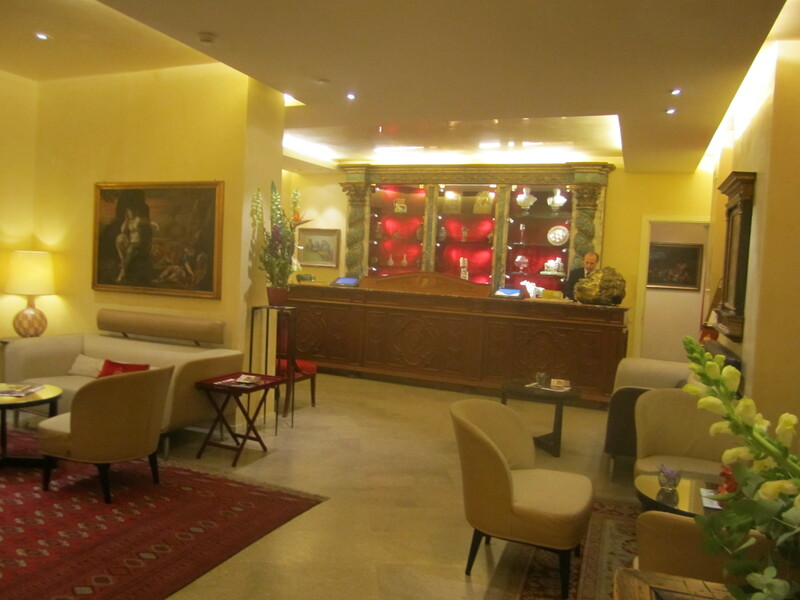 On a narrow street tucked directly behind the northwest corner of Piazza Navona is the vine-covered facade of a lovely, small and elegant hotel — Hotel Raphael. (Spoiler alert: This is quite a pricey hotel.) As we were there in the tail end of winter, the vine-covered facade was barren of leaves. You can click on the link above to get a photo gallery of the hotel including stunning photos of its green-wrapped facade. We asked the desk clerk who showed us to our room whether he was from Rome. He told us that he was from Tuscany. He worked in Rome half the year, but that it was too expensive — OK for tourists but very difficult financially for Romans. He returned to Tuscany the other half of the year where life was easier. 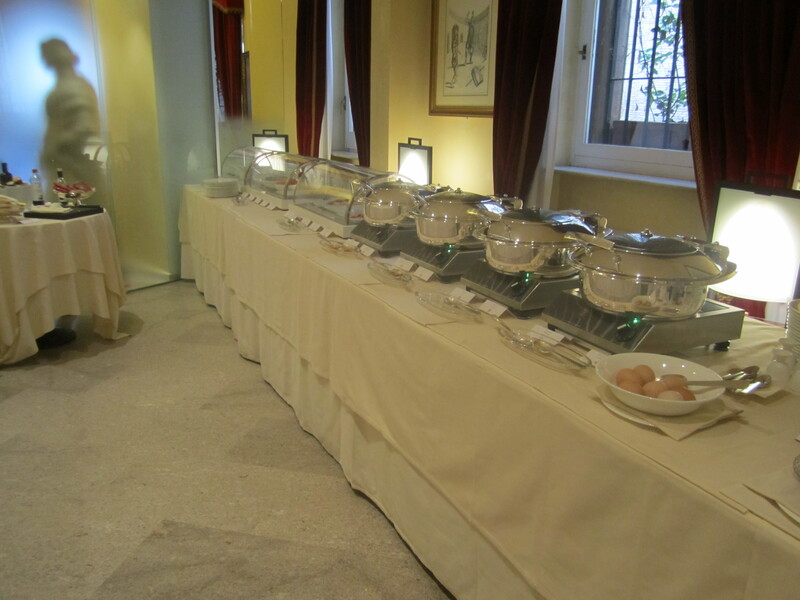 A lovely buffet breakfast served in the Hotel Raphael’s elegant dining room is included in the room price. The hotel fronted on a charming mini-piazza and if you have a room facing on to the piazza you get a nice view through the vines. 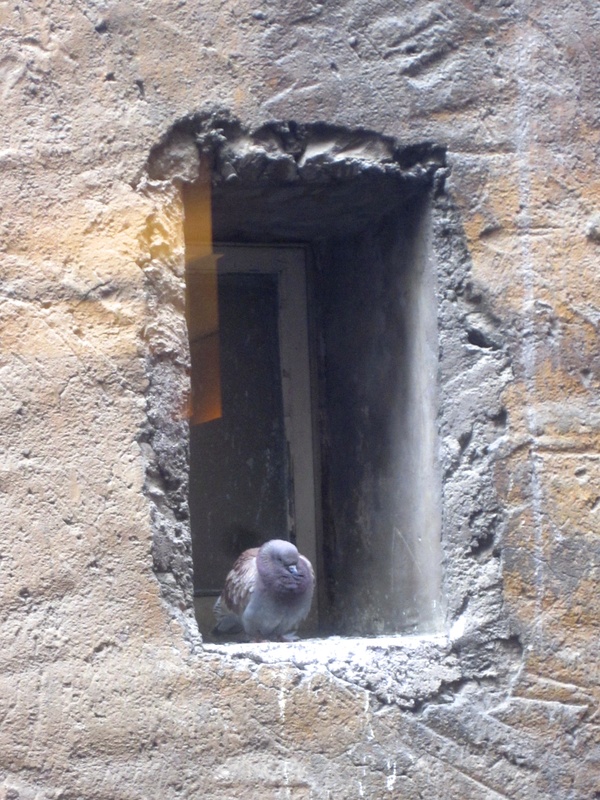 Our room faced the aging building across the alley where a neighboring pigeon lived. 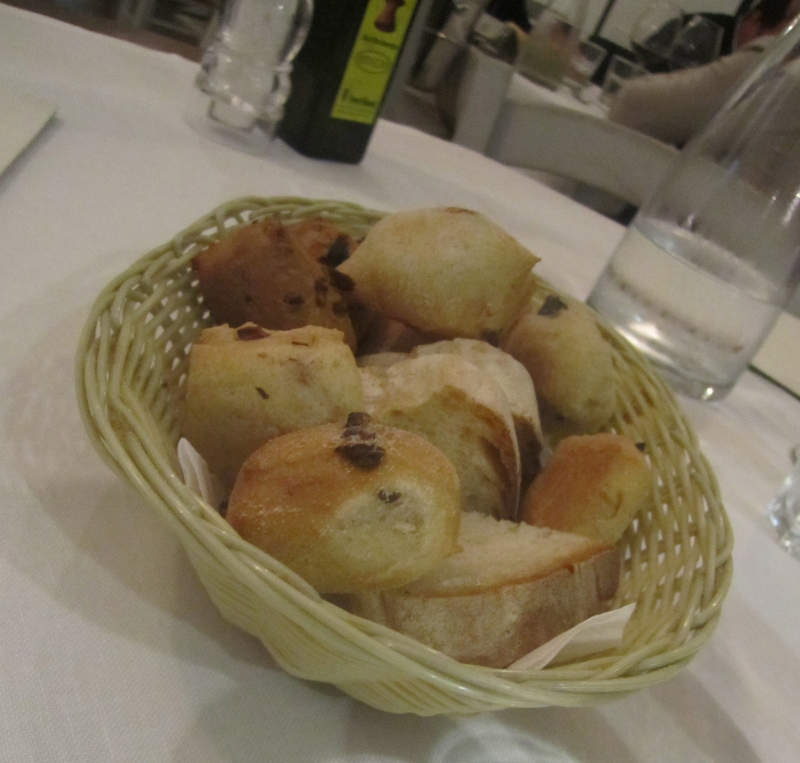 Selecting restaurants in Rome is a challenge. 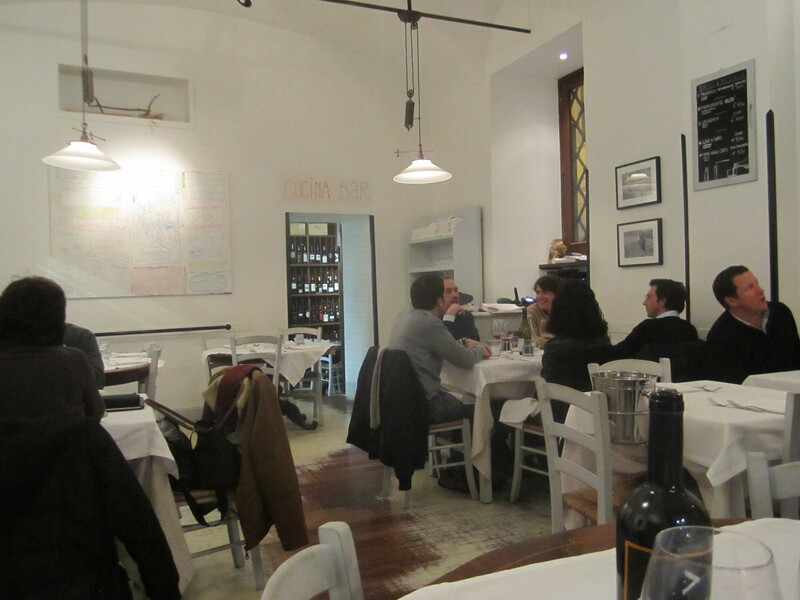 While it is true that it may be hard to get a bad meal in Rome, there is no shortage of ordinary restaurants. 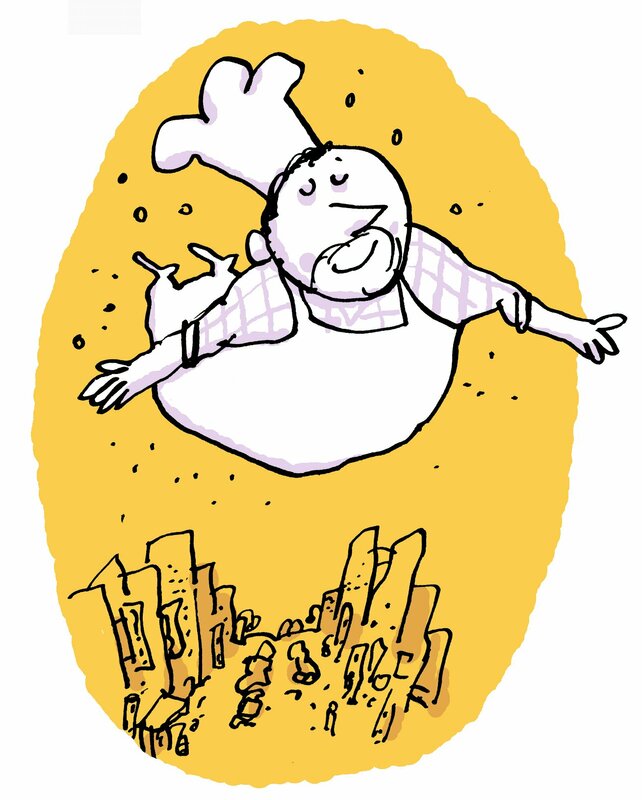 And with so many really good restaurants lurking amongst the ordinary, it’s a shame to waste a meal on ordinary. The challenge comes from the vast quantity of restaurants and how little unanimity there is on restaurants that are special. My selection approach was to catalogue restaurants from review sources with the goal of finding those that appeared on more than one list. My list did not include the crowd-sourced Trip Advisor that is ubiquitous on the internet and suffers from common denominator. Rather I consulted sources ranging from the New York Times to food blogs about Rome to articles in food-oriented publications. It was rare that I found a restaurant appearing on more than one list. At a point we connected with a foodie-friend who lives in Rome and he helped with additional names and editorial guidance. Left with more restaurants than meals, we did our best to make selections with nearly all being really good, some being excellent and a few just ordinary. If you follow along in the blog I will help you compile a list. I am sure there are many other restaurants that could appear on such a list. 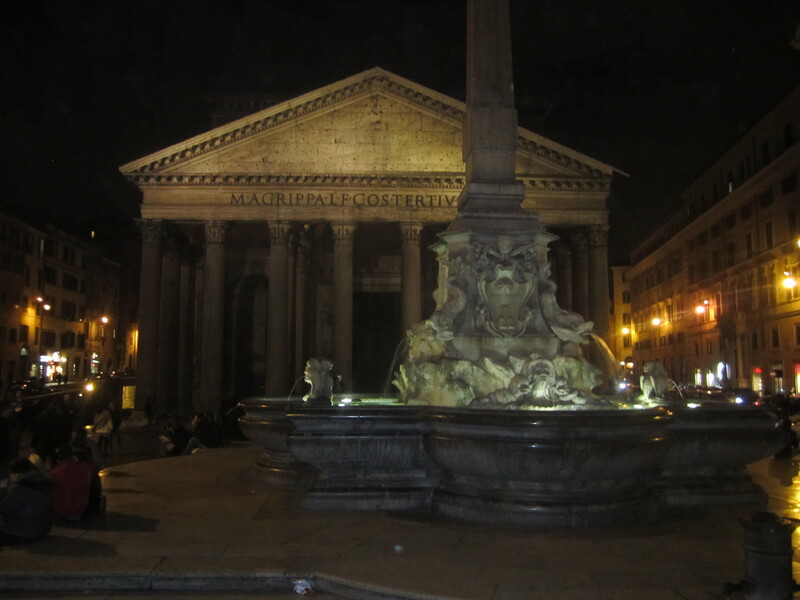 Our hotel was about a fifteen minute walk in the rain from Grano — one small piazza behind the piazza on which sits one of the seminal buildings in the history of the world architecture – the Pantheon. We will return to the Pantheon in a future post. Grano translates in English as wheat. It is paradox that a tourist regards a good restaurant find as one that has few, if any, tourists. A fair assumption is that locals know best where to eat so a restaurant loaded with locals is an affirmation of your choice. So when you go to a restaurant you play a little mind game of “identify the tourists.” If you identify many you think that maybe you made a bad choice. Romans generally look different from tourists and if you are unsure, check out the shoes where differences are most readily revealed. On the other hand, despite a quest for tourist-free restaurants, it helps that someone working in the restaurant speaks some menu English. So your ideal goal is a largely tourist-free restaurant that has someone who can speak to you about food in your native language. A menu in English makes ordering easier but is also a troubling sign as it suggests an overly tourist-friendly place. Oh, it’s such a delicate balance. Grano’s three small warmly modern rooms provided seating for about fifty guests. Saturday night at 9PM it was full. Quirky contemporary art adorned white-painted walls. It’s approach to food echoed its decor — clean, simple, uncomplicated – no contrivances or fussiness. Our English-able waiter brought us a basket of assorted house-made rolls — always a good sign when a restaurant makes its own rolls. Restaurants charge for bread and bring it to your table without asking. Here bread was E1,50. Bottled water is also offered for a small price with a choice of with or without gas — called frizzante which is a fun word to say. Most restaurants filter and carbonate their own water. Non-bottled water is perfectly safe to drink. Grano offered an English menu. We were, after all, in the middle of one of the most tourist-dense areas in the entire world! Rome’s province of Lazio is not known for its wine and little of it is found exported to the United States. Yet, as it’s said, “When in Rome, do as the Romans do.” Throughout our trip we drank mostly local wines — from Lazio and then from the province of Campania of which Naples is capital. The wines were uniformly enjoyable and in several instances — especially in Campania, we discovered wines that we will seek out at home. As we considered our menus, we enjoyed a Franciacorta Rose, a dry rose with a slight sparkle from Lombardy. 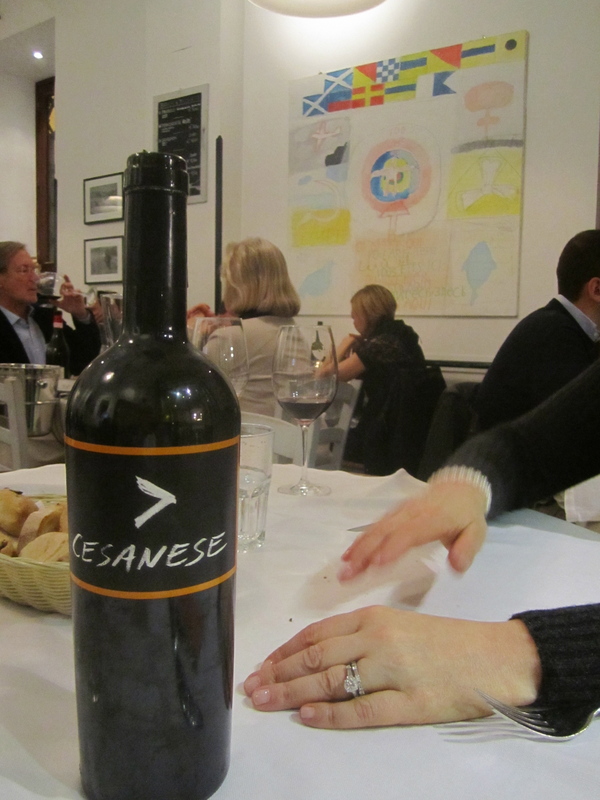 Our dinner wine was a Cesanese, from Lazio – a very old red grape that may have been used in ancient Roman wine making. 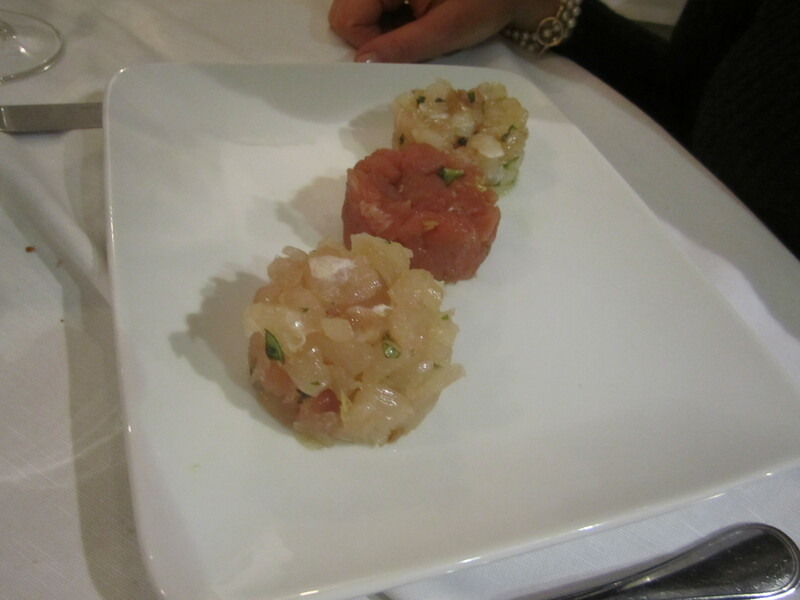 For starters: Three fish tartares – tuna, grouper, something else — coarsely chopped fish, not much else with a little olive oil. The clean taste of the fresh fish shinned through. 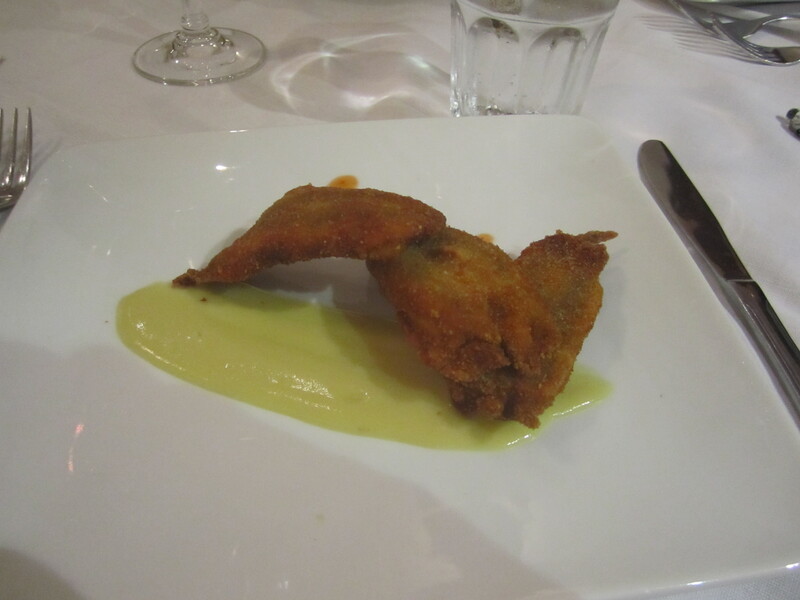 Anchovies “in carozza” was alternating layers of mozzarella and anchovies in a light batter fried with leek sauce. Nothing special — too much breading obscured the cheese and anchovy. 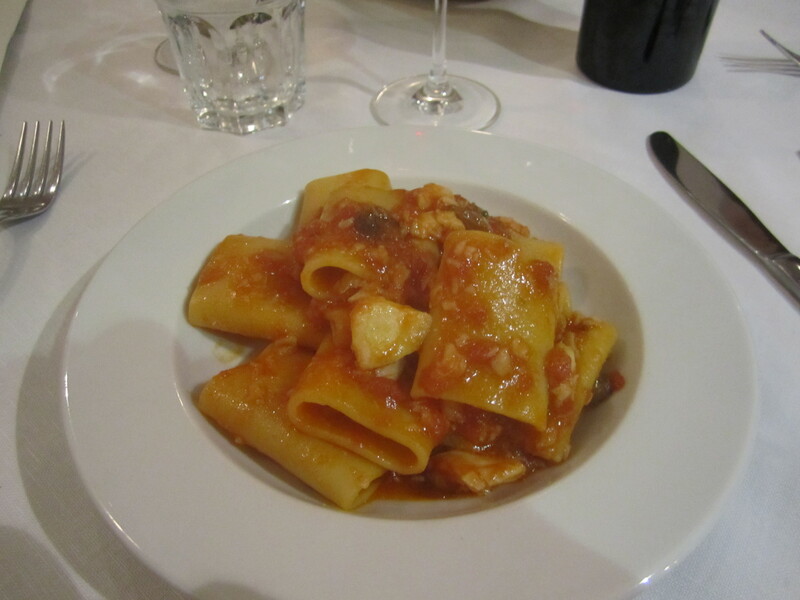 Paccheri de gragnano with codfish was big, fat, perfectly chewy pasta tubes with tomato, cod and an occasional raisin. Squid poached and breaded with aromatic herbs & marinated tomatoes. 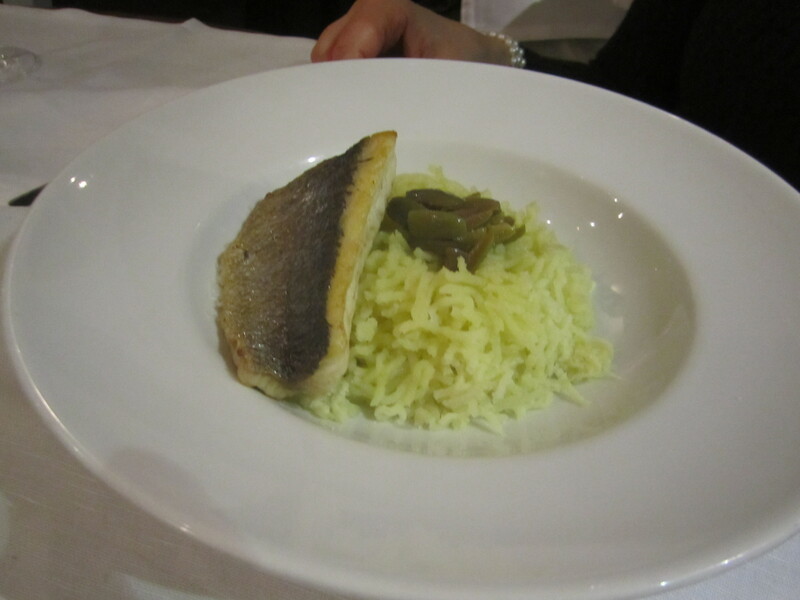 A seared sea bass with “rice” potatoes . The potato actually had the appearance of rice with the texture of potato. Thin slices of green olives finished the simple and straightforward dish. For dessert we enjoyed Zeppole, a warm, just-fried donut with vanilla ice cream and a touch of vanilla custard on bottom and a small serving of house-made pistachio gelato. 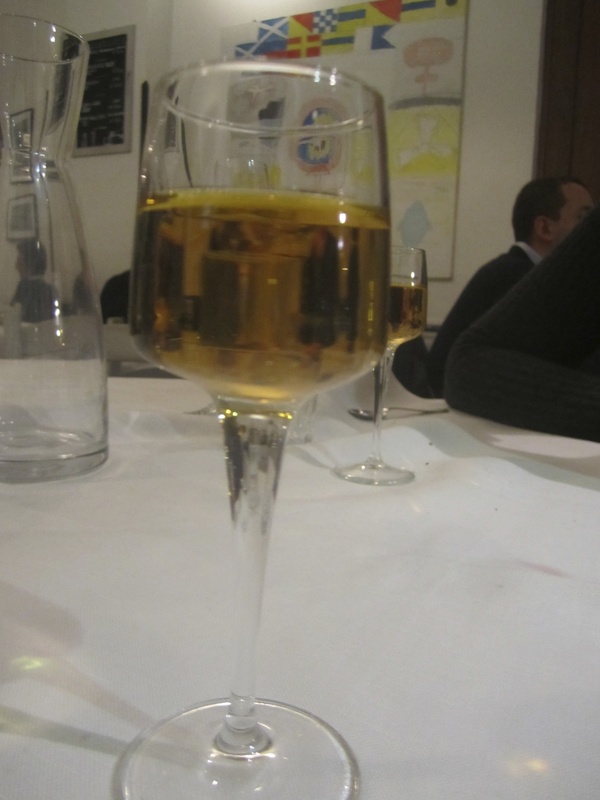 After dessert we enjoyed a Hauner Malvasia della Lipari, a light sweet wine from Sicily. Finally, we sipped espresso that arrived with chocolate-covered orange peel. 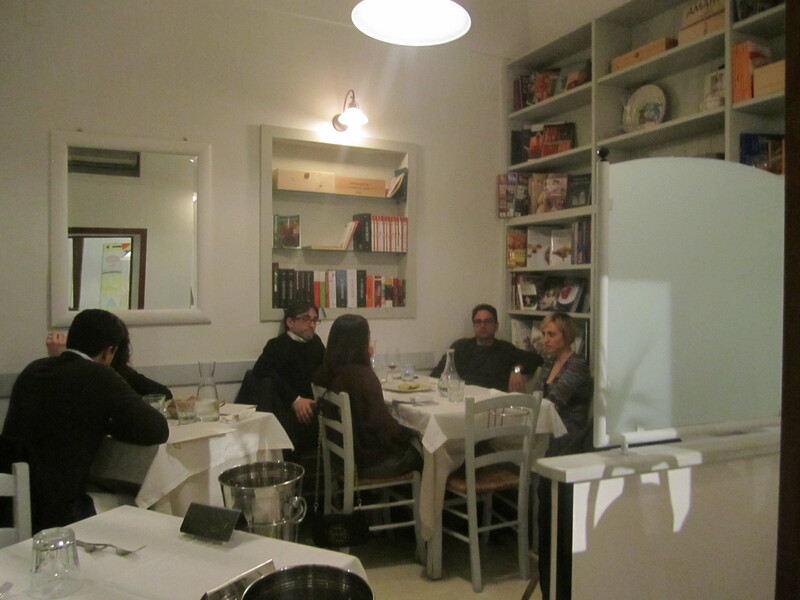 Dinner at Grano came to E145 — about $185 for perfect first evening in Rome. A service charge is not added as it is said that service is included in the price of the food. In general, we added a 10% tip. Tired, thrilled with our first day, we headed back to our hotel in a light rain. Our plan for tomorrow was to meet a guide at our hotel at 2PM who would introduce us to ancient Rome at the Colosseum and Forum. 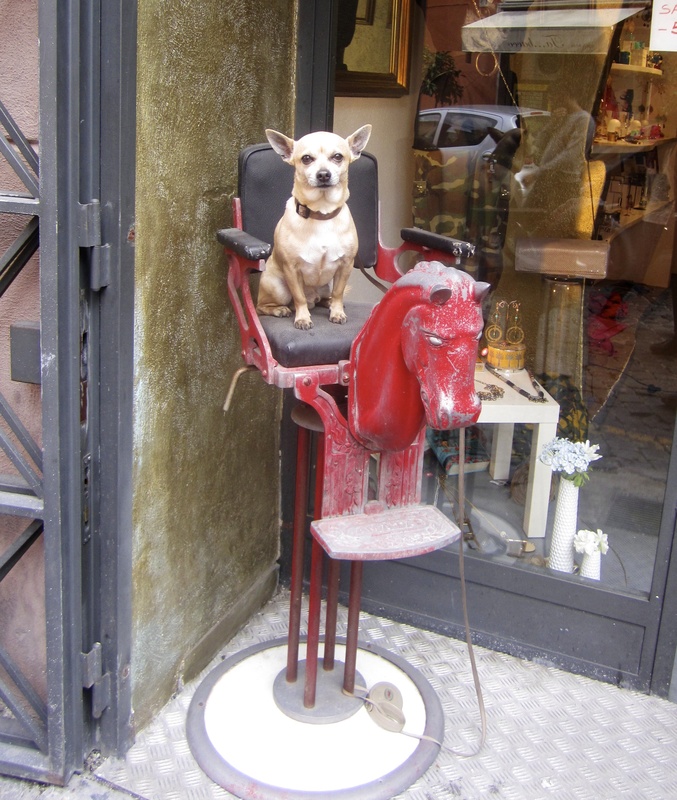 Glad you are having fun in Roma! 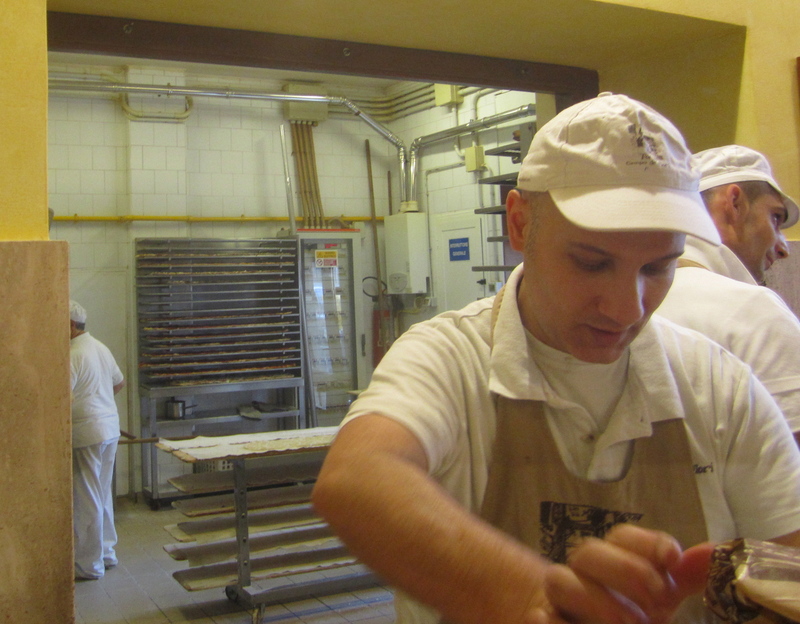 I hope you get to check out Testaccio – neighborhood in south Rome – and the food market there! Currently planning our summer holiday in Rome, so it’s great to read such a detailed review!